The decision was announced some time ago now but this Monday Andrés Iniesta collected the Queen Sofia Award at the ceremony for the National Sports Awards for 2015. The Barça captain travelled to Madrid for the gala accompanied by Club directors Carles Villarrubí and Javier Bordas as well as the director of professional sport, Albert Soler. It was October when the National Sports Council of Spain announced that Iniesta had won the award for 2015 thanks to his exemplary behaviour and off the field. The Barça midfielder is an example to youngsters not just in football but in all sporting areas. 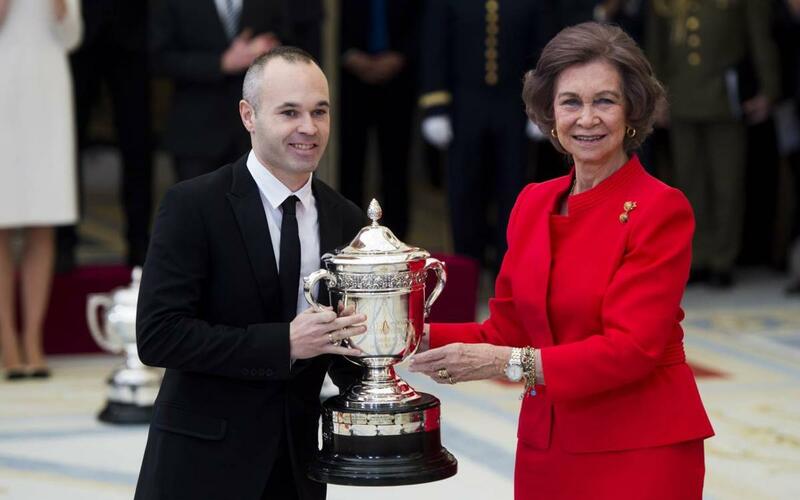 Iniesta received the award from Queen Sofia in the Royal Palace of El Pardo along with other prominent figures in the field of sport who were recognised in the various categories such as athlete Ruth Beitia, basketball coach Sergio Scariolo and Sevilla coach Jorge Sampaoli. The National Sports Awards began in 1982 and recognises the efforts of clubs, associations, federations and individual who have excelled in their various sporting fields. Past winners of the Queen Sofia award include cyclist Samuel Sánchez,Valencia Basketball Club and former Barça player Sergi Barjuan.